A 10 Pound VBAC! Oh Yeah!!! Mason’s birth story begins with the birth of his sister, MJ. MJ was born by unnecesarean on Sep 29, 2007. When I was just over 39 weeks pregnant with MJ, my OB suggested I get an induction, because he was concerned that her size would prevent her from being born vaginally. Ultrasound had estimated her weight at 9 pounds, and my OB was concerned about possible shoulder distocia if we let her get any bigger. Not knowing any better, I agreed to the induction at 39+2. At the start of the induction I was only a fingertip dilated, and not effaced at all, definitely not favorable for an induction. But after almost 24 hours of labor with just about every intervention known to man, which included cervidil, pitocin, an epidural, and being stuck in bed the entire time, not surprisingly I had only dilated about 3 cm, and a c-section was recommended. Exhausted and not knowing what else to do, I agreed to the c-section. MJ was 8lbs 10oz, 21.5 inches long, a fairly big baby! At the time, I was convinced I had done the right thing. MJ was healthy, and that was all that seemed to matter. 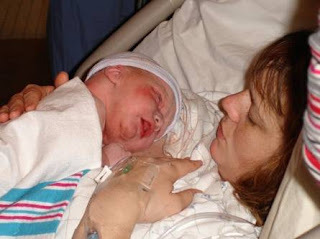 My recovery from the c-section was not awful, but not easy either. Thankfully, I didn’t have much pain, but breastfeeding was not going well, and I had no appetite coupled with unexplainable diarrhea, making life difficult. Thankfully I was able to turn things around, and managed to breastfeed MJ until she self-weaned at 19.5 months old, when my milk dried up due to my next pregnancy. During the time after MJ was born, I began doing a lot of research and decided that the next time I had a baby, I wanted to attempt a vaginal birth after c-section (VBAC). I felt that had I given my body the opportunity to go into labor with MJ, I could have had a vaginal birth, the way babies are intended to be born. And with another child at home, I didn’t want to be stuck in the hospital for 4 days, and not be able to pick her up or drive a car for 3 weeks after a c-section. 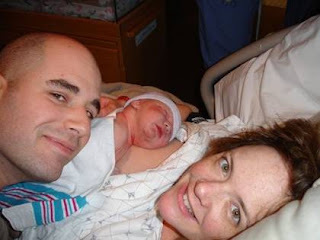 Fast forward to January 2009: My husband and I finally decided it was a good time to start trying to have another baby. Well lo and behold, I got pregnant the first month! My due date was Oct 18, 2009. Initially, I began seeing my old OB for pre-natal visits, the same OB I had been seeing for about 8 years, who performed my c-section and delivered MJ. Right away at my very first pre-natal visit, I was told that I would be having a scheduled repeat c-section, which I knew I didn’t want. However, I didn’t switch doctors right away; I really liked my doctor, just didn’t like the new practice he was with because they were dictating a repeat c-section for me. I continued seeing my old OB for pre-natal visits, all the while waffling and trying to decide if I wanted to find a new doctor, and doing research on who I might switch to. An email from a very good friend finally spurred me on in my decision to find a new doctor. She basically said that if I felt like I really wanted a VBAC, I should just switch doctors so that I could at least be given the opportunity to try a vaginal birth, even if I ended up with another c-section. She was right, and I was inspired! I was telling everyone I knew about my situation, even total strangers at the grocery, asking who was the best in the area for achieving a VBAC, and the answer was the same every time. I found a practice that came very highly recommended with 3 midwives and 1 OB. I switched to Dr. G and the midwives when I was about 30 weeks pregnant, ¾ of the way through my pregnancy! Thankfully they had no problem taking me on as a patient so late in my pregnancy. Right away, I felt at peace with my decision, it just “felt” right. I was told by Dr. G that as long as both baby and I were doing well, I would be able to stay pregnant until at least 42 weeks, in order to give my body as much opportunity as possible to go into labor on my own, since a traditional induction with a VBAC is generally not recommended. I also decided that if I wanted to have a successful vaginal birth, I should hire a birth doula. I felt like a doula might be able to help me get as far as possible in my labor without the use of pain medication or an epidural, which was likely one factor in why my labor didn’t progress with MJ. In speaking with one of the moms of a child at MJ’s daycare, I learned of a birth doula who herself had 2 c-sections followed by 2 VBACs, so I contacted her and decided to hire her. Unfortunately, I knew when I hired her that she would be on vacation Oct 17-24, right around my due date Oct 18, so there was a chance she might not be able to make it for my delivery. But we worked out a plan with a backup doula, in the event that my doula couldn’t make it. The rest of my pregnancy continued without incident. Actually, my entire pregnancy was incredibly easy. I honestly had nothing major to complain about, only about 1 week of nausea in the very beginning, and that’s it. I got to 40 weeks, and began doing non-stress tests twice weekly to monitor contractions and baby’s heart rate. Baby was doing great on the inside, and I was doing great too! During the week after my due date, I began to get a little anxious that I wasn’t going to go into labor on my own, so I began taking evening primrose oil twice daily, and bouncing/rocking/rolling on my exercise ball in the evenings, which did seem to make me contract! On Saturday morning Oct 24, 40 weeks 6 days gestation, I woke up about 3:45am and was having irregular contractions. These were definitely different from the Braxton Hicks I had experienced up until this point, they were painful, and felt like really awful menstrual cramps! I wondered if it could be the start of something, but I didn’t want to get my hopes up. I went back to sleep as best I could, then got up and ate breakfast. I continued having several contractions an hour and they started to pick up in frequency around lunchtime. I began timing the contractions around 1pm, and they were 5-10 minutes apart lasting for about a minute. Around 2pm they picked up to 2-4 minutes apart, and I was starting to get excited! I was pretty convinced we were going to have a baby today! Around 4pm I decided I better call the back-up doula and the midwife and let them know what was going on. Finally around 5pm the contractions were getting pretty agonizing, so we decided to head to the hospital. The car ride there was almost unbearable! I prayed my husband wouldn’t hit any pot holes in the road. We arrived at the hospital and met the back-up doula there. I was wheeled up to triage, where I met my triage nurse. She checked me and I was at 3cm, already dilated as far as I had gotten with MJ! I was hopeful we were on the right track for a vaginal delivery. Then I had to be hooked up to the monitors for about 15 minutes. All I could do to get through the contractions was stand and rock/sway with my husband. The triage nurse told us she talked to M the midwife, and she wanted me to walk for an hour and then re-check me to see if I was progressing. So my husband, my doula and I walked in circles around the atrium area of the hospital. Every time I had a contraction, I had to stop, hold onto my husband and sway or slow dance. I was doing my best to breathe/hum through the contractions, but it was getting pretty difficult. That hour seemed to drag on forever, but when it was finally over and the triage nurse checked me again I was at 4cm and lost my mucous plug after she checked me, definitely progressing! We were then allowed to go down to my labor and delivery room and get settled. When we arrived to my room, it was right at shift change, so I met my nurse, L, who would be with me for the entire labor and delivery. What a blessing to have the same nurse the entire time! L wanted to start an IV, but I asked for just a saline lock instead so I could stay mobile and not have to drag an IV pole around with me. I had to sit on the bed in order for her to insert the IV, and that was SO hard! The contractions were practically on top of each other, I was only getting about a 1-2 minute break in between them. Just about every time she was about to insert the needle, I had another contraction so I asked her not to do it yet. She finally got it inserted, thank goodness! Standing and swaying/holding onto my husband was about the only thing I could do at this point, so that’s what we did. I had to be hooked to the fetal monitors, but it didn’t matter because walking around was nearly impossible at that point. A couple more hours went by, and I was slowly progressing. When I was around 5cm, my water broke spontaneously, fluid was nice and clear. Labor was becoming increasingly unbearable, and breathing through contractions felt impossible. I began losing control and could really only moan/scream/cry through the contractions. At the suggestion of our doula, I tried sitting on the birthing ball, but sitting seemed to make the contractions more painful. When I was about 7cm, we decided I should try and pee to empty my bladder and help the baby move down. I tried and tried to pee and just couldn’t do it, plus sitting on the toilet was SO painful. We decided I should have some IV fluids, because despite continuing to take fluids by mouth the entire time, I was beginning to get dehydrated. It was also at this time that I decided I really needed an epidural, no one suggested it, it was all my idea. So they pushed the fluids by IV as fast as possible to try and finish an entire bag. I felt good about making it to 7cm before getting the epidural since my labor seemed to be progressing well, and baby seemed to be tolerating labor just fine. I was confident that I would get to have a vaginal birth! Soon the anesthesiologist arrived, ahhh he was my savior! He did my epidural the first time, and unfortunately I could still feel everything on my left side. I tried lying on my left side to help the medicine go to that side, but it definitely wasn’t working, I was still in agony. They asked me if I wanted the anesthesiologist to come back and re-do the epidural and I said YES! It was SO hard sitting on the edge of the bed for the epidural, because I had to be completely still which is next to impossible to do with the contractions coming right on top of each other. He finally got the epidural re-done around 11pm, and I felt SO much better. Also around this time was when the midwife left, and Dr. G arrived. I found out later they did this because they were concerned about the baby because after contractions his heart rate would dip. When Dr. G arrived, I felt at peace. He has such a calm demeanor and wonderful bedside manner, he was fantastic. He asked me if I was afraid, and I actually wasn’t! After getting some pain relief from the epidural and donning the oxygen mask, I attempted to get some rest while I labored down the rest of the way to 10cm. At around 1am on Sunday, Oct 25, Dr. G came in to check me and said that I was complete and I could start pushing! I was SO happy to hear that! I wasn’t feeling any pain, but when contractions came I could still feel lots of pressure down there, which was helpful to know if my pushing was effective or not. Also, I asked for a mirror so I could SEE if my pushing was effective too. After an hour or so of pushing, Dr. G gently suggested that he could use the vacuum to help the baby come down, but I politely refused and said I wanted to keep trying to push the baby out on my own. Dr. G was SO patient and didn’t try to convince me otherwise, so I just continued pushing on my own. Dr. G held my right leg, and my mom held my left leg because both legs were pretty non-functional from the epidural. They lifted my legs up for me and then I held my own feet with my hands, pretzel style! I continued pushing with each contraction, I was totally in charge of the pushing, and Dr. G applied warm washcloths to help soften the tissues. At the time, I thought, “Oh how nice! I wonder if he does this for all moms?” Later it dawned on me that I requested this in my birth plan! Finally at 2:45am, I pushed Mason out, it was incredible! His cord was wrapped around his neck once, which was probably the reason why his heart rate would dip with contractions. When he came out they put him directly on my belly skin-to-skin and began drying him off and rubbing him to get him breathing well. My husband said, “So are you going to tell everyone his name?” I said, “His name is Mason! Mason Erik.” Everyone loved the name! Dr. G waited a good 10 minutes or more for the cord to stop pulsing before asking my husband to cut it. The placenta delivered easily on its own a short time later, no effort required by me, and Dr. G began to stitch me up (I had a 2nd degree tear.) Mason stayed on my stomach for a very long time before they finally asked me if I wanted them to weigh him. Dr. G asked me how much I thought he weighed. I said, “Oh, maybe 9 pounds or so?” Dr. G said, “I’ll guess 9lbs 12oz.” I said, “No way he’s that big!” So they finally put him on the scale and he was 10lbs 1oz! 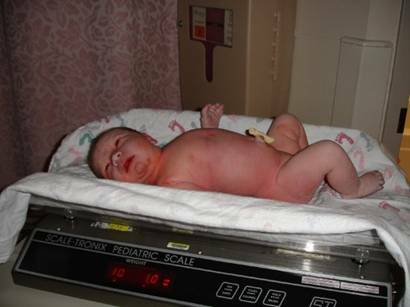 I could not believe I delivered a 10 pound baby! I was in shock. After they weighed him, they wrapped him up and brought him back to my belly. I stayed in the labor and delivery room for several more hours while my epidural wore off, and my husband went with the baby to the nursery so he could get his first bath. When my husband brought Mason back, he was pretty sleepy, but we attempted breastfeeding for the first time. We then moved down to the post partum room, and tried to get some rest. We attempted nursing several more times during that first 12 hours or so, but Mason was so sleepy it was difficult to wake him up to latch on. I called the lactation consultant to provide some help, and of course he latched on perfectly! He has continued nursing like a champ ever since. When Mason was about 24 hours old, they tested his bilirubin and it was elevated. We were advised he should receive some light therapy and formula supplements. I agreed to do the light therapy in the room, but didn’t really want to give any formula, especially by bottle. Mason ended up staying under the lights for about 12 hours, and I did give him a quarter ounce of formula by dropper one time (which he promptly vomited up), but my milk was already coming in at that point so I just nursed him often overnight. By morning his bilirubin levels had already started to come down, and his color looked great. We went home from the hospital a few hours later! The entire birth experience was truly amazing. I recovered so well, and fast! If I could have done anything different, it would have been to switch to Dr. G and the midwives at the beginning of my pregnancy. I truly believe switching to a VBAC-friendly practice was the key to achieving the birth experience I desired. Seeing him crown and then be born was the MOST incredible experience, and one I will NEVER forget. I would highly encourage any mom-to-be considering a VBAC to go for it!! Even if I had ended up with a repeat c-section, I would have known in my heart that I did everything I could to try and prevent it. My story is similar to yours in that my doctor with my son wouldn't allow VBAC candidates and he closed his practice when I was at 35weeks. The practice I was referred to ENCOURAGED me to try it if it was what I wanted. Thank you and God bless you and your two little ones! Now I can sleep much more easily and get through the rest of this crazy pregnancy!